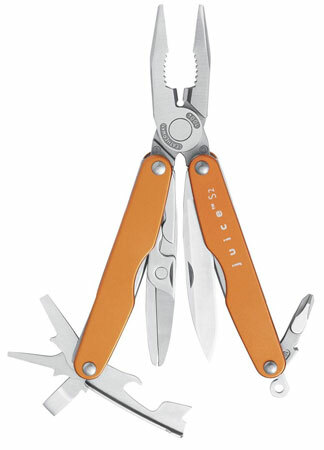 Leatherman’s Juice series of multi-tools are smaller and more casual in appearance than the models most people think of when you mention the brand. Despite their smaller and more pocketable size, Juice multi-tools pack plenty of tools and functions between their handles. Every Juice model features combination pliers, a stainless steel body, anodized aluminum handle scales that are available in different colors, outside-accessible tools, and at least one knife blade and screwdriver bit. The nice thing is that the scissors on the XE6 are not only outside accessible, but they fold closed (instead of open on full-sized Leatherman tools) and have ridging for assisting in cutting things like fishing line. I believe that the scissors on the S2 and CS2 (S for “Scissors” and C for “Corkscrew) are mostly the same, but lack the ridging on them. Anyway, these are great tools for the vast majority of people who’d otherwise pick up a SAK (Swiss Army Knife) or a devoted wine tool for picnics, light camping, hiking, light-weight DIY, etc. I personally got through half of college with a C2 (then someone stole it) and then got though the rest of it with an XE6.